Dave is one of Gru's top minions. Of course--why shouldn’t he be? Surely there is no minion superior to Dave; he loves ice cream, he has sweet hair, plus he helped invent the rocket launcher! How do you say “Go, Dave!” in Minionspeak? While many adults wouldn’t be able to tell the minions apart, you can and you know that Dave is your spirit-minion. A lover of sweets, a dedicated helper, a (semi)intelligent and loveable little guy, that Dave. 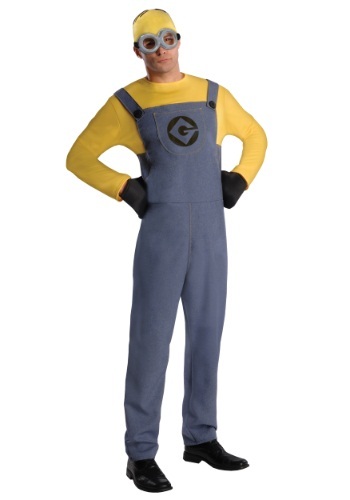 How about turning yourself into one of Gru's go-to guys by wearing this Adult Dave Minion Costume out this Halloween? You can dress up with a bunch of buddies and form the whole crazy little clan, or you can go solo and try to win Lucy’s affections. You could even pick a pal to dress up as Felonious Gru and you two could make quite a splash at the big bash! After all, adult life can be pretty serious--shouldn’t Halloween be a time when silliness can prevail? Well that’s good, because nothing is sillier than a minion! That unintelligible dialect, those big eyes, their childlike wonder at the world--minions are goofballs at heart! You’ll feel attuned to your inner minion the moment you step into this jumpsuit, which is fashioned to appear as the minion’s signature yellow skin under blue overalls with the letter “G” on the front. This look even includes three-finger black gloves (which is good, because those are hard to find!) and a yellow latex headpiece. Adjust your silver minion goggles and get ready to babble energetically all night long! Go, Dave!